No special 'nozzle' is needed for this design, if a suitably tight-fitting bung can be found for the tube from the air pump. It means that children can build and launch their own rockets. One that inflates and deflates plastic nappy bags to show how our lungs work, and one that gives you a magnified view of your eye with a pushbutton-controlled light to make your iris contract. 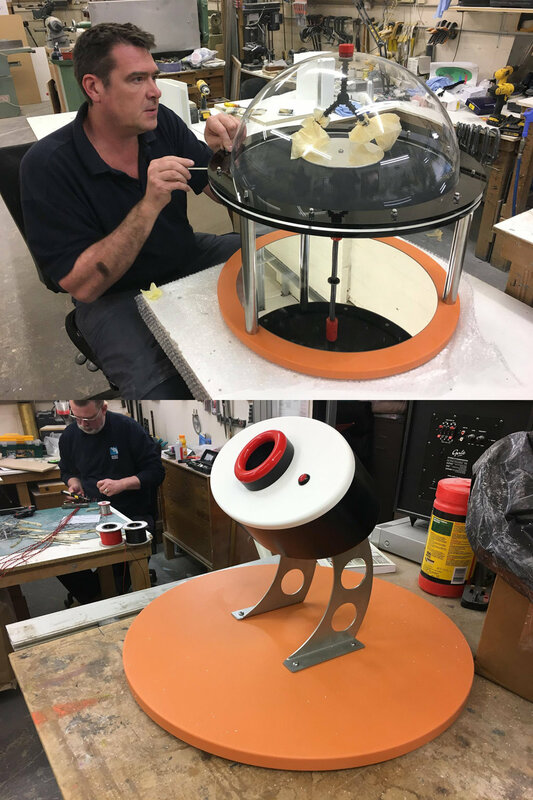 Slightly larger than our standard Mini-interactives, these have 60cm diameter bases. This thought-provoking and rather startling article shows how a limited focus on improving people's scientific knowledge and understanding can actually increase their resistance to scientifically validated truth. The author concludes that we must cultivate curiosity as an end in itself, not merely as a useful aid to 'learning'. I have just set myself the challenge of taking living cultures of microscopic creatures to this year's Ecsite Conference in Portugal and setting up a microscope with a video camera and screen, to present some demonstrations from my Blown-up Biology Show. This will be at the so-called 'Grand Bazaar' session. Christmas greetings! Take four shiny Christmas baubles and stack them in a tetrahedron arrangement. Look closely at the reflections where three balls touch, with a fourth ball behind the gap. Be amazed at the Wada Basin fractal patterns. The after-dark Pirate Parade last Saturday in Buxton was delightfully weird and wonderful. I contributed bubbles. In this photo, my evening science show at the annual conference of the Southern Africa Association of Science and Technology Centres is being introduced by, er, our conference host. This is an interactive exhibit I shall be sending out shortly. The hand is being reflected by the shiny inner surface of a hemispherical black acrylic dome. You can see something similar if you look at the reflection on the concave top of a very shiny metal spoon. The reflection appears to float IN FRONT of a concave mirror. They remained in service for over ten years until the space was completely redesigned. Shortly afterwards, they were rescued by the Unizulu Science Centre in Richard's Bay, South Africa, where I was delighted to see many of them still in constant use nearly thirty years later! Nearly finished today, this really is one of the prettiest interactives we've made recently. It uses light polarised by the material used in the lenses of Polaroid sunglasses to show coloured stress patterns in the same kind of plastic used for making soft drink bottles, when a gentle sideways force is applied. Creating a human circuit at WissensNacht Ruhr in Gelsenkirchen, Germany, last Friday. Here's a lovely little movie clip of my Smoke Ring Thing at our New Mills Festival Lantern Procession. Art like this deserves a category of its own. Watch until the end to see how it works. My Bubble Fest today in High Lea Park, New Mills, was amazing. We estimated that about 5,000 people came and traffic was seriously gridlocked at times in the centre of our town. Blasting a water-filled 2-litres plastic bottle into the sky at the Einstein Island science festival on Lake Trasimeno, Italy. Local friends, please don't miss my microscopic marvels this Thursday evening at St Georges Parish Hall: New Mills Festival has never seen anything like this before!